Here’s a quick one, which is perfect because it’s precisely the idea of Jaden Hair’s book, The Steamy Kitchen’s Healthy Asian Favorites , which was just delivered to me (I saw a preview and wrote a quote for the book). It’s full of pretty amazing ideas for quick Asian dishes that can be made with easily available ingredients – often ones you already have in your pantry. Honestly, I don’t think I’ve ever gone from opening a package containing a cookbook, to making something from it, to eating it. I’d made some kimchi a few weeks ago (there’s a quick version in the book that is ready in fifteen minutes) and had some lovely French farm eggs on hand, so decided to whip myself up a kimchi omelet for a mid-morning snack. People in France don’t normally eat their lovely eggs for breakfast, nor is kimchi a common pantry item, but like Jaden, I’m have a tendency to forge my own path. So a few eggs, some chopped kimchi, and a couple of moments in a hot skillet, and voilà! – that was fast, my kimchi omelet was ready. Adapted from The Steamy Kitchen’s Healthy Asian Favourites by Jaden Hair of Steamy KitchenI don’t think I’ve ever made a recipe so fast from a book. And it wasn’t just easy, it was a great-tasting dish that came together in a couple of minutes.Jaden’s recipe called for zucchini slices, which I didn’t have on hand, so I omitted them. But mushrooms, peas, or a fistful of chopped greens (like kale or Swiss chard) would be other possibilities, or even seafood such as shrimp or prawns. She did mention the secret ingredient is mirin, which I did have on hand from making Teriyaki Chicken. If you don’t have it, you might want to add a tiny dash of rice wine vinegar and a teensy sprinkle of sugar. 1. Mix the eggs in the a bowl with salt, a few turns of black pepper, and the mirin. 2. Heat the oil in a nonstick skillet. Sauté the zucchini, (or other vegetables) scallions, and kimchi for 2 minutes, stirring occasionally. 3. Add the eggs and cover the skillet, and let cook for 2 minutes over moderate heat. 4. 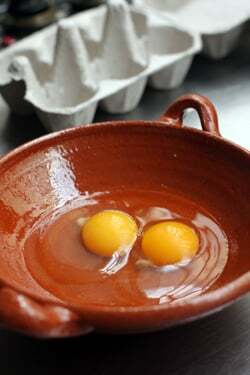 Remove the lid and fold the omelet in half and cook further if you prefer your omelets more cooked. Serve with additional kimchi on the side if you like. This sounds SOOOOO good. Thanks! I love Korean food! There are a number of Korean restaurants in Paris although the food and flavors are rather timid. Spciy foods don’t enjoy the popularity in Paris as they do elsewhere, but I think that newer flavors & cuisines are coming into the mix here, and I think a Korean noodle or kimbap bar would be a big hit. Kimchi and eggs often for breakfast here thanks to you. Love your Kimchi recipe. I went to a well known Korean bbq in LA and my boyfriend was all like “your Kimchi is better than this.” Heck yes it is! You rock David. Thanks, and glad you like my kimchi recipe! A funny story – a few years ago, I was seated on an airplane next to an unassuming little old man, who wasn’t Asian. We started talking and somehow the conversation turned to what he did, and he told me that his wife was Korean, and they made their own soy sauce in their garage. And when others found out about it, how good it was, they started sharing (and selling) it to others. He also told me about all the kimchis and other pickles and Korean foods he and his wife made together. It was so cute because he looked like some meek little grandfather and here he made all these amazing Korean foods. It just goes to show that good food crosses all boundries, and ages, and cultures. I’m an American expat in Seoul who has become a tab obsessed with kimchi over the past couple of years. Especially in eggs. Glad to see it’s getting its due love around the world! I just don’t like kimichi. I guess fermentation isn’t my thing, but I love omelets and often use homemade salsa in mine. I think it comes from my days in Austin. The cookbook looks great! Does it have a good recipe for a kimchi pancake in it? I love kimchi pancake! come to berlin, david! after vietnamese cuisine has been extremely popular here, korean restaurants start to take over the leading position, with new restaurants opening like every month. i’m not an expert, but i thought most of them were really good and authentic. i love food. i love that kimchi omelet. i love your website. Omelet is my breakfast of choice so I’ll try this variation. The French love the oeuf à la coque (and their perfect cooking time can start wars in the kitchen!). Eating habits vary from person to person, family habits, region, spare time in the morning, willingness to eat in the morning… The French do not collectively have one way of eating. I would make an omelet at the weekend but not during the week, it seems a bit heavy. Could you clarify where the mirin goes? Is it such a secret an ingredient that you’d have to kill us if you told us? 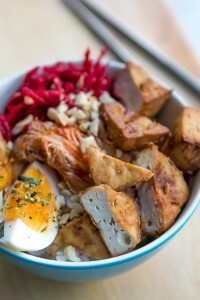 I love my kimchi with fried eggs, but I might have to branch out. I’m lucky enough here in Austin to live next door to a Korean War veteran and his Korean wife. Sune has raised my awareness of Korean food by continually providing me with dishes that she’s cooked. I return the favor by plying her with Southern cooking and BBQ. I’d love to turn the tables on her and prepare this dish for breakfast this weekend. Thanks for the great idea! I also want to know where the mirin goes? 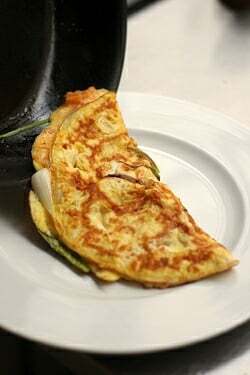 Eggs and kimchi are somewhere on a top of my list of favorites…I’ll be making this omelet, thanks! I will definitely try this! ! 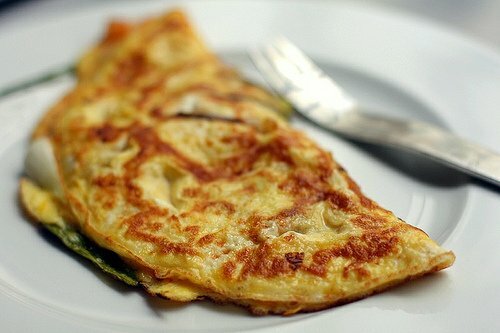 I make a similar omelet which uses fish sauce instead of the mirin. Has a great non-breaky flavour. david, a beautiful recipe! Might I make a suggestion that might knock your socks off next time you make this? Try squeezing all the liquid out of the kimchi and frying it a little longer until it starts to brown. The Maillard effect does wonders for this condiment. It’s something my mom, a Korean chef, taught me as a kid whenever we cooked with kimchi. Also, don’t be afraid to use more in your omelette! Great fan of yours–thanks for all your marvellous postings!! Just writing to ask you where one can buy that gorgeous red earthenware dish that you used to place the eggs in. It looks very Spanish/Moorish. Just beautiful. 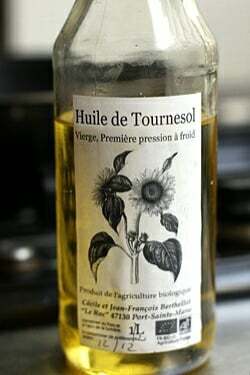 It was a gift from a friend who lives in Gascony. I don’t know where to get them, unfortunately. But if you’re in Paris, there is a vendor in the covered Marché St Germain des Pres in the 6th that sells Gascon pottery and similar items. Man I know what I’m having for lunch… Thanks! Looks so welcoming don’t even mind waking up to a snowy morn if this awaits. Now I just need to find kimchi in Minnesota. I needed a winter challenge. Right on, David!!! Keep forging. We love everything you do. In response to elma kim – Bibimbap on de l’Hopital (in the 5th) is a decent option. The menu isn’t super extensive, but the food is pretty good. Yes, it’s okay. Gubino on the rue St Anne and Ace Bento near there are okay as well. There is a place off the rue Cler in the 7th whose name escapes me which is fine – but I would skip Euro, which was highly touted by an American newspaper and I ran over there, but it was not memorable. HI David I have only been following your blog for a week and have already really enjoyed your posts and recipes. I am now inspired to try Kimchi (I have been meaning to ever since reading Sandor Katz’s book – Art of Fermentation but using it in an omelette is a brilliant idea, particularly as we have a lot of eggs chez nous). I am English living in the Gers; if you have a number of followers based in Europe would it be possible for you to put French/English names for ingredients where they differ from the US? For eg, napa cabbage I know of as Chinese Leaf or Chou Chinoise! Although it wasn’t that difficult to find out via google! BTW the buckwheat cake stayed moist and delicious for a whole week ( I can’t comment after that because we had finished it!). re the list of items to bring to France – I endorse the maple syrup idea. The bottles here are tiny and not very good quality. The rasp grater is now available here, I bought one in my local Leclerc last Autumn and believe me the Gers is very rural! In the city of Minneapolis, Minnesota, there is a young women who opened a fantastic pizza restaurant. She is Korean. The restaurant is Pizza Lola. One of her speciality pizzas is a kimchi pizza with banchan, Korean sausage, scallions and hot peppers, sesame seeds and oil. She uses 00 flour and a beast of an oven. This is the greatest way to enjoy kimchi. Her restaurant and the pizza were featured on Diners Drive-ins and Dives and while it was being filmed Andrew Zimmern came in. Thank you so much for this! I recently happened to find (and make) both your kimchi and Olympic Seoul Chicken recipes. Both came out awesome. I like that I can throw together random meals with my big jar of kimchi (like the fried rice I made last week), or have an instant side vegetable. This omelet will be perfect for dinner tonight. Kimchi is very popular here in Hawaii, but I just don’t care for the fermented stuff. We use the phrase “you’re in deep kimchi” to mean you’re in trouble! Thanks for your writing David, I love it! Love kimchi and love eggs but never put the two together. Had had kimchi fried rice. This recipe sounds great. Will try it and let you know. 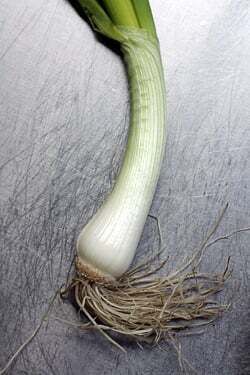 Just read your kimchi recipe and your post on how much scallions cost. You should just regrow them in water! IT WORKS! You can also replant them as long as the roots are still in place. Here’s a site for you to check out. PS I would also try stir-frying the kimchi and browning it a bit before I put it in the omelette to reduce the water content and bring out the more tangy dimension and a different sort of crunch. Koreans love to cook kimchi on the tabletop bbqs in k-town! Yes to this omelet! I have a big batch of kimchi that I made just the other week and I cannot wait to mix it with some eggs. This looks like a good, good dish. I was inspired to make this tonight with what I had in the cupboard/fridge and it was great! I used sushi vinegar instead of mirin, and wakame instead of spring onion and it worked really well. A very adaptable and quick recipe. Thank you for sharing. Great! I like that this recipe is pretty adaptable to whatever you have on hand. I would imagine it would be great with any kinds of pickles and mix of fish or vegetables. Happy to hear you liked it, too. Last week I did a Chocolate-Buckwheat Cake and the week before I did How to Make Chocolate Bars. 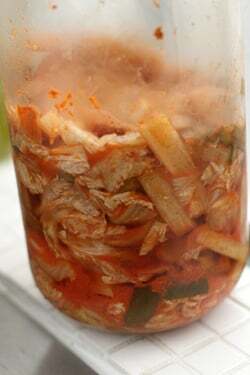 How great that you make your own kimchi! Most of my Korean friends never make any, they either buy it or wait for their mom to make some :) I make some every other week or so because I just love kimchi…such a convenient thing to have in the fridge! My favorite is kimchi stew with tuna..I could it this every day! This is something I will make soon – never thought of the combination. But doesn’t the omelet look a bit overdone and thinner than an omelet should be? Or is that the intention? It isn’t made like a French-style omelet, so instead of it being light and fluffy, it’s more compact and browned on the outside because it’s left in the pan for a couple of minutes, covered. It reminds me of Korean pajeon, a big, flat pancake (often with kimchi in it) that’s cooked until browned. I actually like my eggs on my more cooked side, so it was just right for me, but you can see in the top photo that the filling is still soft and a bit runny. I wish someone would open an international breakfast resturant or a resturant with international foods . I am tired of ham and eggs! I love reading your blog! This reminds me of kimchi pancakes, which is a popular dish with Koreans. My mother was just visiting me from the East Coast (I live in the Bay Area) and she’s the most incredible Korean cook and she made them for us while she was here–the recipe involves chopped kimchi that’s gotten a little old and sour, one or two eggs, special pancake flour that you can buy in Asian markets, and my mom includes diced pork belly or bacon which add delicious bits of flavor to this dish. 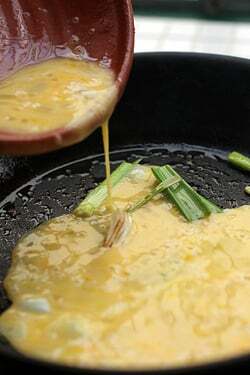 The batter is intended to barely bind together the main ingredients, similar to the Korean scallion pancake (pahjun). It’s one of my favorite things to eat. 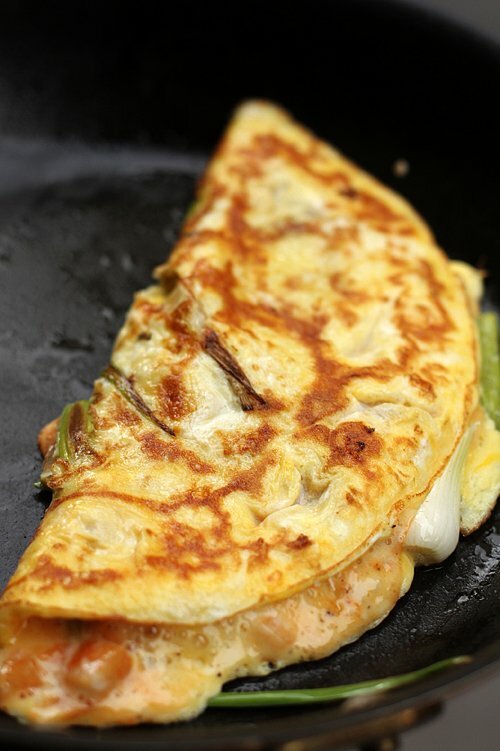 This is a creative way to enjoy both kimchi and omelet. I’ve never thought those two would go well together. Anyway, I’m happy to hear that you love Korean food! I read all that is new in Paris through your blog like vegetarian burger, tacos and like. Ramen seems big now in U. S. Not sure if Parisians are catching on. Chicken wing shops are everywhere now here ( not a fan but heard Korean fried chicken wings are good). I remember not so good and expensive Asian food there in Paris so it is good to be able to cook them on your own. I really love your blog. 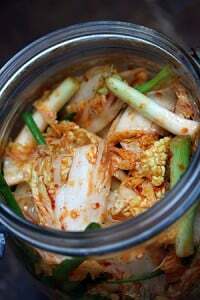 Have recently discovered kimchi and much to my surprise I love it. I found a recipe for a kimchi pancake with shrimps. It’s so good but I will also be trying this too. I love including fermented foods in our daily diet. Great breakfast idea…..
And I don’t think I’ve ever made a recipe so fast from a blog. The gorgeous pictures got my attention immediately. That our fridge currently holds kimchi and some gorgeous local farm eggs, I was out of my chair and in the kitchen in a flash. What a wonderful pairing of textures and tastes. Thank you. Awesome – and unexpected – combo! Kimchi like all fermented food i.e., sauerkraut, umeboshi pickles are all very good for one’s health. It should be included in our diet on a daily basis as it strengthens and supports our digestive and immune systems— thereby helping our bodies to fight off and prevent diseases. Having said that I made the kimchi omelet yesterday, following your recipe except instead of the mirin ( have none at the moment), I substituted it with the Marsala wine. The result was fine. I love kimchi and eggs, usually separately but together, they are outstanding. Thank you for the recipe. That is one good-looking omelette! I can never get mine to look so lovely golden brown. Do you fry yours in butter? I’m Korean and I don’t know why I never thought of this–haha! Looks delicious. Thanks for sharing the idea. Love your blog. Caity: I used the oil, the amount indicated by the recipe. I used a non-stick pan, which I like for eggs. Pippa: There are ramen shops in Paris, mostly clustered in the rue St Anne, and they are packed at lunch and dinner. There is not a lot of creativity (ie: most have the same offerings) but it’s nice to have them there. I love that you actually respond to your readers! It truly sets you apart from the many bloggers out there. I’m guessing you are already aware of the many uses of kimchi. Have you tried kimchi pancakes (kimchi jeon)? A yummy little snack. Check out maangchi.com for inspiration (not my blog, nor am I affiliated in any way!). I have tried several of her recipes they have all turned out delicious. At the end of a weeks holiday in Tokyo i made Kimchi omlette as our farewell dinner with lots of stuff hunted and gathered from the Tsujiki fish market and the Mitsukoshi food hall – before heading of to Kyoto – kimchi omlette has gone straight into the repertoire of my standard recipes with strong Tokyo associations. I’d never thought of combining eggs and kimchi. Brilliant! Can’t wait to try the recipe! Is spicy food popular at all in France, or do French people in general not like overly-spicy or hot food? I like this way of making an omelet, with the lid! It fluffs up very well and very quickly in the pan, folds easily, tastes delicious! It burns very easily on the bottom though, sooner than I think! I made your Fresh Ginger Cake for my ginger-loving Mother this week and she absolutely loved it! Thank you from us both!! I happened to have just bought scallion kimchi from a nearby Korean market. The fermented scallions are a natural complement to the mirin mellowed eggs. This has become my absolute favorite dish! I made this kimchi recipe a while back and tonight I added it as a condiment to my usual Hainan style poached chicken (along with the sesame/soy dressing, cucumber, mung bean sprouts and coriander). It was pretty damn good.